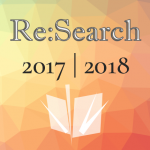 Re:Search’s 5th issue is now live! Congratulations to all authors and their faculty mentors on such great work this year. Thanks fo everyone for such a great year, and we can’t wait to see what the 2018-2019 year brings!